Valerye Huff, Rachel Beck, Alanna O’Hara, and Hannah Yamamoto named honorable mention in the Nisqually league!! Wolves 1 Win From State! Sequim moved within one game of qualifying for the State tournament on Tuesday night. They beat second place Hazen 66-53 in a loser out game. Leading the charge was junior Rachel Beck pulling down 15 boards and scoring 21 points for a double double. Guards Hannah Yamamoto and Valerye Huff scored 13 points apiece in a well balanced attack. Brittany Langston pulled down 7 boards and Alanna O’Hara pulled down 10 boards and took to charges on defense. Langston also had 8 points. Molly Fletcher put in 5 points for the Wolves. Sequim plays Lakes in a winner to State game on Thursday, February 24 at Auburn HS at 8 p.m.
Sequim gutted out a loser out game against Peninsula at home on Thursday. In the third quarter Sarah Moores tied the game with a rebound and put back and a free throw. 3 consecutive three point shots by Hannah Yamamoto (2) and Valerye Huff (1) put the game out of reach. Sequim won 56-41. Yamamoto led the team in scoring with 14, Huff had 13, Rachel Beck 10, and Alanna O’Hara had 7 points. On Saturday, February 19th, Sequim traveled to Buckley to play White River. White River lived up to the #1 District rank and beat Sequim 75-46. Leading the scoring was Yamamoto with 13, Beck with 10 and Jenet Mingoy with 10 points. Sequim travels to Puyallup to play Hazen in a loser out game on Tuesday night at 8 p.m.
Klahowya 69-26 on February 11. 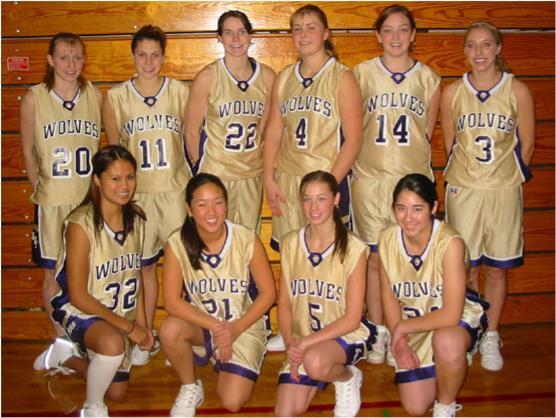 With their 8-4 record, the Wolves ended up in 3rd place and a play-off pigtail game against Peninsule on February 17. On Tuesday, February 1st, first place Steilacoom handled the Wolves 47-34. After the first quarter, the score was tied 8-8. The Lady Sentinels controlled the boards and pressed Sequim forcing 21 turnovers. The Lady Wolves, played hard and were led by Rachel Beck with 9 points and Valerye Huff and Hannah Yamamoto with 7 each. Their next game is a must win against Life Christian at home on February 8th, their final home game of the season. If they can win the next two games they stand a good chance of gaining a playoff game to qualify for the District tournament. Sequim beat Seattle Christian 42-38 at home, Friday, January 28th. Valerye Huff’s 4 point play in the final quarter and Hannah Yamamoto’s two free throws put the game out of reach when Seattle Christian out scored the Wolves 18-9 in the final quarter. Huff and Alanna O’Hara had 10 points followed by Yamamoto’s 7. Sequim beat second place Orting to move to 5-2 in league and 10-5 overall. Leading scorer was Rachel Beck with 12, followed by Hannah Yamamoto with 9, Valerye Huff with 8, and Alanna O’Hara with 5. Sequim was up 26-16 in the third quarter when Orting went on a 16-2 run leading 32-28. Hannah Yamamoto and Valerye Huff led the charge to tie the game 39-39 and Justine Textor stole the ball on an Orting inbound pass with seconds to go in the game. Textor then inbounded the pass to O’Hara who drove past a pick set by Brittany Langston to seal the win with a 10 foot jumper, 41-39. Sequim plays at Vashon Island on Tuesday, January 25th at 7 p.m.
Sequim beat Cascade Christian 58-44 Tuesday night, January 18th at home. Leading scorers were Rachel Beck and Hannah Yamamoto with 15 points each. Valerye Huff added 13 points to the well-balanced attack. Rachel had a double-double with 16 rebounds. Sequim improved to 9-5 overall and 4-2 in league. They play Orting at home on Friday, January 21st. Sequim beat Port Townsend on January 11th for the first time in two year 61-51 in overtime. The game was tied at the end of regulation 47-47. Rachel Beck, Hannah Yamamoto and Valerye Huff were the leading scorers. Reachel Beck, Alanna O’Hara, and Justine Textor led the team in rebounds. Sequim posted a 64-22 win on Friday January 14th against a very young Foster team. Leading the way was Alanna O’Hara with 16 and Hannah Yamamoto with 12 points. Foster scored only 5 points in the first half. Sequim downed Chimacum 48-45 on Tuesday, January 4th. Valerye Huff scored 21 points, Justine Textor scored 7 points and had 14 rebounds. On Friday, January 8th, Sequim lost to Eatonville 52-40. Val Huff scored 10 points and had 10 rebounds. Hannah Yamamoto had 9 points, Justine Textor had 8 points and 10 rebounds. Alanna O’Hara had 9 boards. The Ladywolves play Port Townsend on Tuesday in PT. The girls lost two at the White River Tourney over the Christmas break. They played White River and Bainbridge, losing 69-34 and 69-29 respectively. Valerie Huff had 9 points and Hannah Yamamoto had 8 in the White River game. The team faced a very quick and talented press, but the girls played hard the entire game. Against Bainbridge, Alanna O'Hara had 8 points and Rachel Beck had 7 points. Justine Textor chipped in 5 pts. Their record is now 5-4. The girls lost to North Mason Friday, 55-44. Valerie Huff had 21 points, Alanna O'Hara had 10, Hannah Yamamoto had 6, Angeneth Mingoy had 5. their next game is at White River on the 28th of December. The Lady Wolves improved to 5-1 Tuesday hammering Klahowya by 36 points, 46-10. Leading scorer was Val Huff with 12, Hannah Yamamoto had 8. 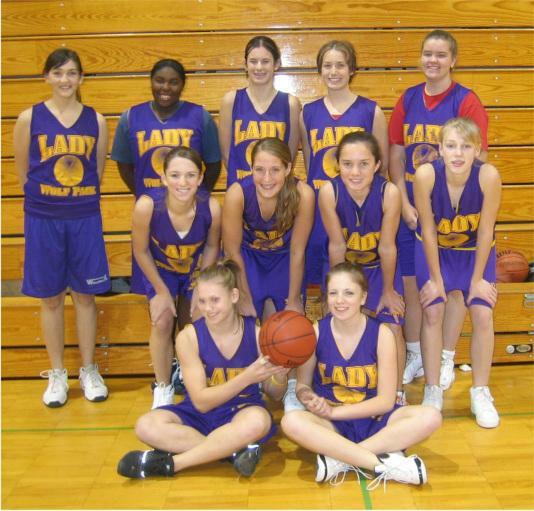 Angeneth Mingoy had 7, Brittany Langston 6, Alanna O’Hara 6, Justine Textor 4, and Molly Fletcher 3. The Lady Wolves travel to North Mason for their first league game Friday at 5:45 p.m. The Lady Wolves lost their first game of the season losing to Jefferson HS in Federal Way. Jefferson is a 4A school and plays in the SPSL league. Sequim led at the end of the first quarter, but ended up losing 45-35. Leading scorer for the Wolves was Brittany Langston with 14 points and 6 rebounds. Valerie Huff had 8 points and Hannah Yamamoto 7 points and 5 rebounds. The taller Jefferson squad struggled to score against Sequim’s tenacious zone defense in the 4th quarter. The next game is at home Tuesday against Klahowya. Sequim improved to 4-0 after beating Forks on Friday, December 10th in Sequim. Forks rallied to take a one point lead in the third quarter but the Wolves quickly regained the lead, winning 46-39. Valerie Huff paced the Wolves with 17 points, knocking down 2 three pointers. Brittany Langston had 10 points and 13 rebounds and took a couple of charges earning two Blizzards from Dairy Queen. Alanna O'Hara had 8 points and 9 rebounds and Hannah Yamamoto had 5 points and 3 assists. Angeneth Mingoy had 3 steals, 2 assists and took a charge thus winning a Blizzard from Dairy Queen. Sequim travels to Jefferson in Federal Way on Saturday. Saturday night, December 4th, the Lady Wolves, playing their first home game, beat South Whidbey HS 52-40. Leading the Wolves were the guard duo of Valerie Huff (19 points) and Hannah Yamamoto (18 points). Justine Textor pulled down 10 rebounds, Alanna O’Hara had 9 boards, and Rachel Beck had 6 boards. Yamamoto had a game high 3 steals, with O’Hara and Beck posting 2 steals apiece. They play Forks again on Friday, December 10th at home. Sequim improved to 2-0, beating Forks 50-37 in Forks. Alanna O'Hara led the Wolves with 14 points, Angeneth Mingoy had 9, hitting 9 out of 10 freethrows, Brittany Langston had 7 points and 8 rebounds. Hannah Yamamoto had 6 steals and 6 rebounds. Sequim plays South Whidbey on Saturday, Dec 4th at 5 p.m. The JV squad beat Forks in the early game. The girls beat Olympic HS last night at Olympic. The score was 41-27. Leading scorer was Alana O’Hara with 13, Valerie Huff and Hannah Yamamoto recorded 8 points each. The ladies stretched the lead to 20 points during the third quarter. The next game is at Forks on Friday, JV at 5 p.m. with the varsity following. South Whidbey visits Sequim on Saturday for the first home game of the season.